Antimicrobial, energizing and warming. When used in massage blends, Cardamon Essential Oil has a stimulating and antispasmodic action on the digestive system, helping to settle tummy upsets and ease muscle cramps. It also and acts as a general tonic to the nervous system, making cardamon oil invaluable when you are feeling depleted after a hard day or exercise and need something to give you a boost of energy. 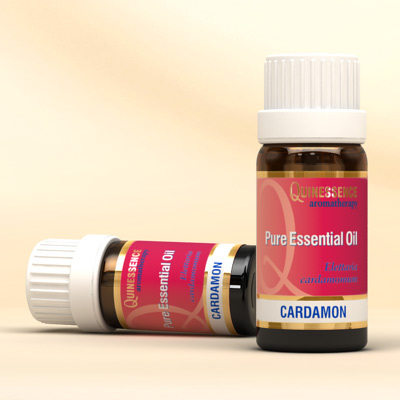 Cardamon Essential Oil (also known as Cardomom and Cardomum), is derived from the dried fruits by steam distillation, and the resulting oil pale yellow to colorless oil has a delightfully unique, warm and spicy aroma with fruity nuances, and a balsamic almost floral backnote. When vaporized, this essential oil helps to clear and refocus the mind, increases concentration, and restores feelings of contentment. The powerful antimicrobial properties of Cardamon Essential Oil are particularly effective when used in a mouthwash to improve oral hygiene and eliminate bad breath. This is why cardamom seeds have been chewed since ancient times to kill oral bacteria and freshen the breath.